Yesterday Turkey and Russia agreed on a further de-escalation in Idelb province in Syria (see the update here). This agreement takes away the chance of an imminent wider war in which the U.S. and some of its allies would use a fake ‘chemical attack’ as a pretext to launch missiles against a large number of Syrian government targets and military positions. A peaceful solution to the Idleb situation is unsatisfying for Israel. The successful Syrian defeat of the Jihadi enemy inside the country would allow Syria and its allies to concentrate their forces against Israel. Israel wants the Syrian government destroyed and the country in chaos. On Sunday, September 16 Israel tried to hit an Iranian Boeing 747 fright plane at Damascus airport. The plane allegedly carried an Iranian copy of the Russian S-300 long-range air defense System for the Syrian army. On Monday around 10:00 pm local time 4 F-16 jets of the Israeli air force, coming from the sea, launched missiles against at least three targets on Syria’s coast. The strike came only hours after Israel released satellite images of what it called “strategic targets” in Syria. 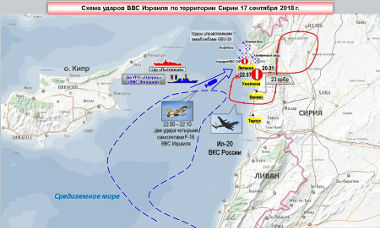 The integrated Syrian and Russian air-defenses responded. The Israeli air force had warned the Russian forces in Syria only one minute before the strike. 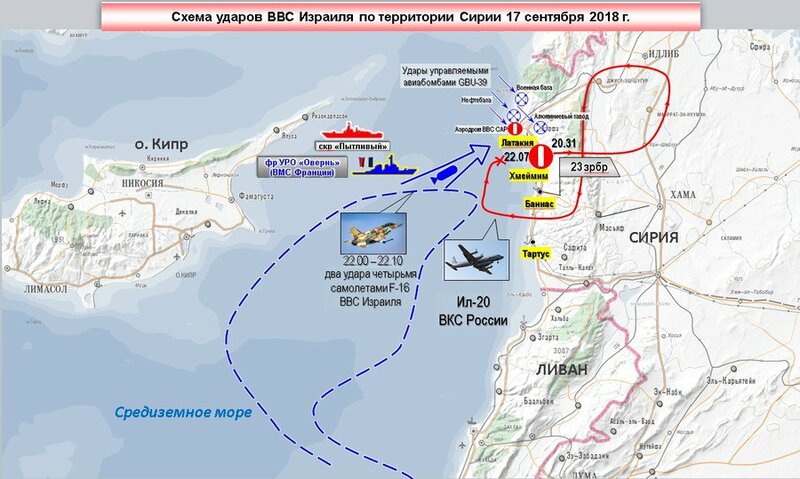 A Russian IL-20 electronic warfare airplane (red line) was preparing to land at the Russian airport near Latakia just as the Israeli attack (blue) happened.